With observations made with the Herschel Space Observatory, with the APEX antenna and with the ALMA interferometer it has been possible to observe the formation of a cluster of galaxies in deep space, when the universe was only a tenth as old as it is now. Ivan Oteo, a former student of the University of La Laguna and of the Instituto de Astrofísica de Canarias led the international team that made the discovery. Until now, astronomers thought that these phenomena occurred 3,000 million years after the Big Bang, but this new result shows that they were already happening when the universe was 1,500 million years old. The European Space Agency (ESA) launched the Herschel Space Observatory in 2009. It was the first observatory that could capture far infrared spectra over the full range. 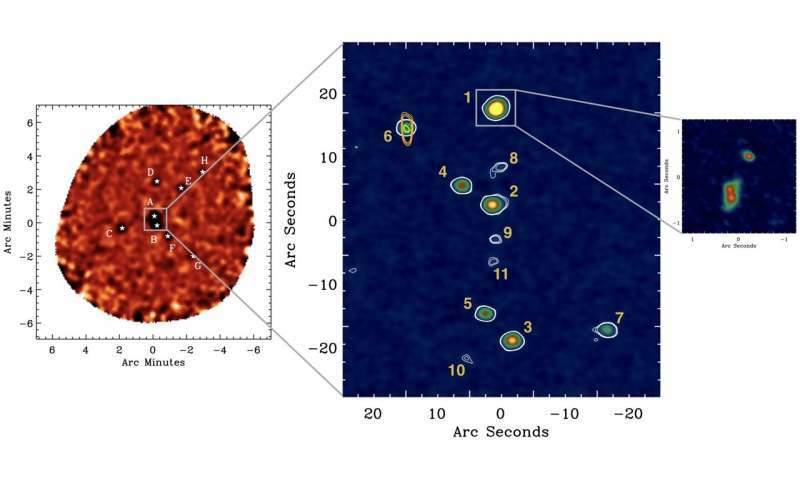 The team of researchers focused on what seemed to be a single cosmic object that is very red in the far infrared, and decided to study it with APEX and ALMA. APEX is a 12m diameter radio telescope in the Atacama desert in Chile, which was set up as a first step in the project ALMA, a group of 66 radiotelescopes of 7m and 22m in the same area. The result was the discovery of a concentration of dusty galaxies in the early universe. They are on the point of merging to form the centre of a future massive galaxy cluster. Ivan Oteo, the principal investigator on the study, who currently works in the Institute of Astronomy at the University of Edinburgh and the European Southern Observatory, points out how rare it is to observe this type of phenomena. "We think that the duration of dusty bursts of star formation lasts a relatively short time, "he explains, and adds, " these galaxies are usually in the minority at any epoch and at any place in the universe. That is why finding a large number of bursts of dusty star formation emitting at the same time like this is very puzzling, something we need to understand." Ismael Pérez Fournon, researcher at the University of La Laguna (ULL) and the Instituto de Astrofísica de Canarias (IAC), says, "Using the data from ALMA, whose resolution and sensitivity are very high, we are able to study the formation of clusters of galaxies when the age of the universe was less than 1,500 million years." Helmut Dannerbauer, another researcher at the IAC and the ULL involved in the discovery points out the difference between this result and "the present theoretical and computational models, which suggest that this type of very massive cluster needed much more time to evolve." An independent study led by Tim Miller, a doctoral research student a Dalhousie University in Canada and Yale University in the United States, have discovered a similar concentration of galaxies. In their case, the finding was based on observations with a telescope at the South Pole, with the Herschel Space Observatory, and follow-up observations with APEX and ALMA. "We still do not know how these clusters of galaxies grew so much and so quickly. They did not form gradually during thousands of millions of years, as current theories of the formation and evolution of galaxies predict," says Miller. Scott Chapman of Dalhousie and Cambridge Universities says, "These discoveries give us a great opportunity to study how massive galaxies joined together to form galaxy clusters." That is why finding a large number of bursts of dusty star formation emitting at the same time like this is very puzzling, something we need to understand." I have come to really discount the opinions of cosmologists. Who cares what you discount or otherwise? You are just a crank posting on a science news comments section. Could we care less?